Well that made me laugh anyway. Theme of the morning: Doodie and Immaturity. And bread! I love it. I could eat it for every single meal for the rest of my life and be happy. My favorite food is toast. Seriously. Toast and butter. That’s it. Any time, no matter how I feel. No matter what else is available. It’s my go-to. It’s also kind of bad for you. I know this. So before anyone jumps on my comments and scolds me for the loaf genocide I commit every day, I concede. I have to give it up. At least give it up as my main food source. It’s made with all kinds of evil “white” ingredients. White flours and white sugars, etc. And of course, if you don’t know this, it contains ALOT of sodium. As comparison, milk and butter have a near 1:1 ratio of sodium to calories. Oatmeal, on the other hand, has zero sodium for all its calories. Provided you eat only the original flavor and from the cylinder carton. The instant packets are still processed with it. It’s kind of strange. You can’t taste it, but it’s there adding mg’s where you don’t need them. Bread though, actually has more sodium than calories. I think that is just wrong and so disheartening. Being low sodium almost forces you to eat less calories because the foods that contain zero sodium naturally, are almost all naturally good for you. There are exceptions or at least things that people could fire back at me and argue. Dark chocolate has zero sodium (Check those labels though, because some companies slip in a 10 or 15 mg, and you have to pick your battles here) and isn’t made with milk. Which is an extra bonus for me because I avoid dairy like the plague. Milk chocolate does contain sodium and sometimes alot because milk has alot naturally. See how that works? I have been spending twice as long at the grocery store in the last few weeks, and going more often, because of all this label attention and the fact that fresh foods do not last as long as processed foods. I know it will get easier and faster once I am totally acclimated to the ↓Na Club. Anyway, the point of this post was that bread up top has ZERO sodium. And it’s made with whole grains and stuff. Another entire subject I could write another paragraph about, because I have to switch to those too. Brown rice, brown breads, orange potatoes, wheat pastas and the like. I cannot confirm the “rightness” or nutritional level and benefit of the exact grains in this particular bread because I don’t know that food group well enough yet. 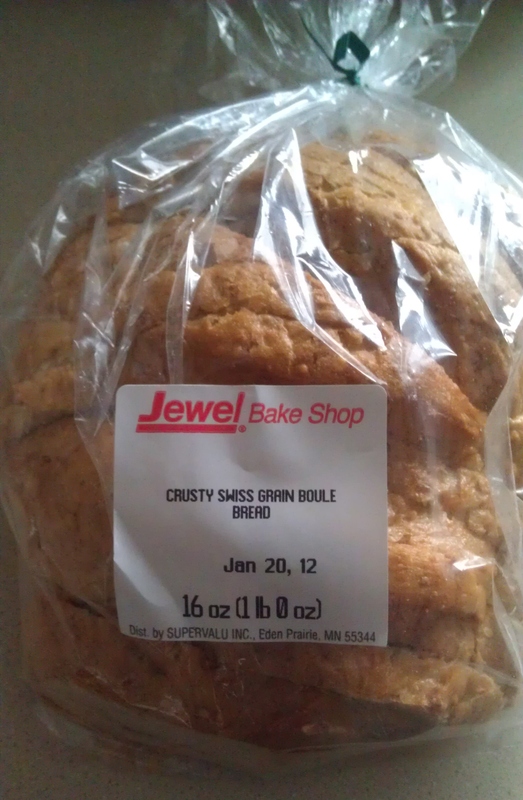 But I think it says it’s made with whole grain wheat, which I think is the good stuff. I can confirm at a later date if anyone really cares as I am currently out of my supply. I’m still transitioning slow on the whole grain thing because white mashed potatoes are so delicious. And what’s better with Chinese food than white sticky rice? Oh yeah, weight loss and low blood pressure. But, to get back to this bread. At first I thought it was pretty gross. It is very noticeably without salt. It tasted bland and flavorless. Almost “flat” tasting. After eating it for a few weeks though, I find it to be quite delicious and grainy. It’s my new favorite bread in the whole world. And you can buy it at Jewel. That makes it available to quite a large population. Try it if you can find it. Tip for the tasty: Buy one first to get used to it. Then when you love it like I do, buy all the loaves that they have whenever you go. It sells fast I have noticed. I have even purchased the uncut version. I’m just crazy out of control for that bread! Here’s the big finish. Literally. Tying together the doodie part with the whole grain part. You will know you are eating whole grains when you can enjoy their nutty, crunchy, complex flavors going in. Toasting, spreading, chewing, swallowing. And then you get the chance to enjoy them all again on the way out. Sometimes good health is NOT pretty. Whole grains have shells, exoskeletons, kernels, a hard outer coating that we, as humans, cannot digest. They call it roughage. I call it proof. I’m going out into the 55 degrees for some of that exercise stuff. Have a great afternoon!